How Much is Jack Link's Worth? 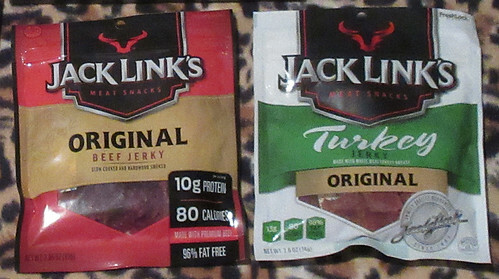 Back in 2008, I posted an entry on this blog about Minong, Wisconsin, home to the Link Brothers and Jack Link's Jerky. It remains one of the most read posts on this blog. I thought of it a couple of times this past month. Yesterday, we noticed this new furniture design studio just up the block. 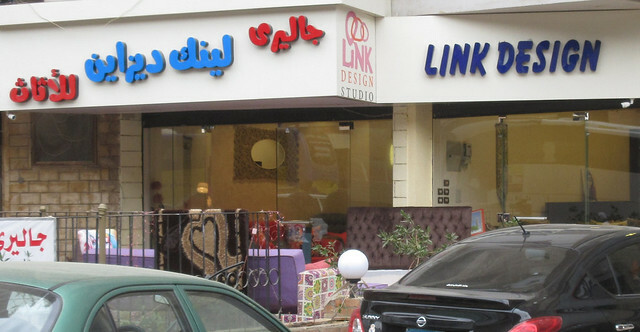 Has Link Brothers gone international and expanded again? The other time I thought about it was during the Superbowl when Sasquatch made a 60-second appearance promoting Jack Link's Jerky. 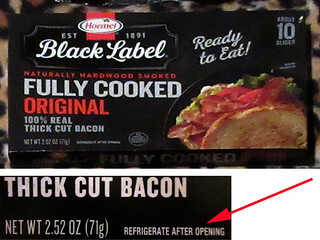 I thought back to the 1980's when we used to drive over to the Link Brothers store in Minong for bacon while we were up at our northern Wisconsin cabin. Who would have thought that there would one day be a Link ad on the Superbowl? One day in 1985, Jack was deer hunting with his sons. They bought some jerky that tasted awful. So, Jack took an old family recipe and made his own. “It was really good and I said ‘We can sell this,'” he said. And sell it they did. Recent estimates credit Link's with $1.3 billion in sales and perhaps a 50-60% share of the snack meats market! Net Income 1.7 0.7 ?? Mkt Cap 31.3 23.1 ??? Since Jack Link's is privately held, we don't know their Net Income. But when your market share is 50% or more, you have to be doing at least as well as anyone else in the food business. A business valuation guru would discount value for private ownership but bump the value for "owning the market." A reasonable guess at valuation would probably be between $2 and $3 billion. That is up in Trump territory and makes you wonder why Jack is not on the Forbes list of wealthiest people in Wisconsin. Maybe that was part of the reason for the Superbowl ad buy? 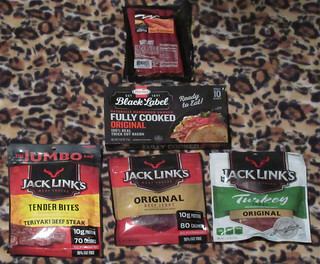 Meanwhile, Linda did bring her own supply of Jack Link's Jerky. One of those items we can't find locally. but don't quite have Internet access yet. Workers from the phone company attacked the telephone line problem yesterday evening. Opening up the blue box, they located and disconnected our phone line coming up over the top of the building and down the front from our unit. How do they work in that rat's nest, you may wonder? One man brings a small box to the phone jack in the apartment. This generates an RF signal that the other worker can locate in the rats nest. We are now connected via a different box down the street by the mosque instead of the blue box by the beauty shop. That gets us onto the fiber connection up by the papyrus shop; the previous routing was via copper way up the street at the supermarket. (Do I seem to know more about my network than you do about yours? Welcome to Egypt.) Net result, we have dial tone and the landline works. The ADSL connection? Not so much. As of last night we had a solid DSL light on the router but only an intermittent Internet light. This morning we had a solid Internet light but still no Internet connection. Perhaps one more day? One more call to TE-Data was all that was required. We now have Internet service at 4mbps (that is called high-speed here) and have WIFI throughout the apartment. 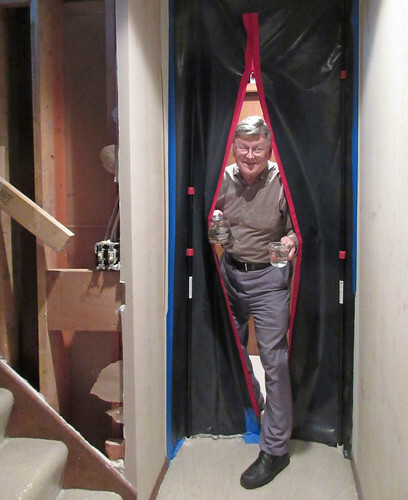 A good friend of ours is supervising the interior construction of a new home for his daughter. We went along with him to watch the progress of this project and perhaps compare it to our own recent remodeling project in the US. The new villa is located in a "gated community" northwest of our part of the city. 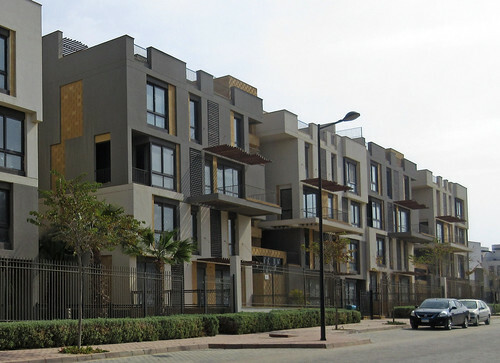 The development is known as Beverly Hills. 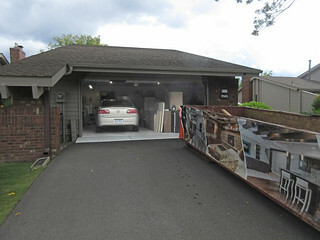 Most of the homes we saw are two or three bedroom units in the range of 2000 to 2500 square feet. Others nearby range up to 5000 square feet and beyond. Our friend's daughter's unit is part of a four-plex configuration and is located on a quiet residential street with off-street parking in the back for the residents. This stands in quiet contrast to our high-rise location near the always busy Ring Road. I doubt there will ever be donkey carts dispensing propane tanks or junk men soliciting cast-offs on this street. Interiors in these building are constructed in much the same fashion as I have described previously. Wall are brick with a stucco-like covering. 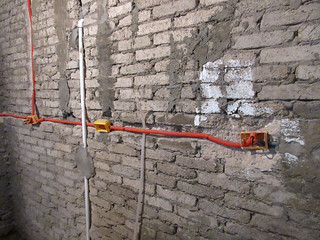 The wiring and plumbing are put in place before the stucco is applied. 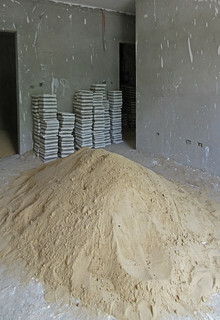 A pile of sand lies in each room ready to be mixed with the cement and applied. 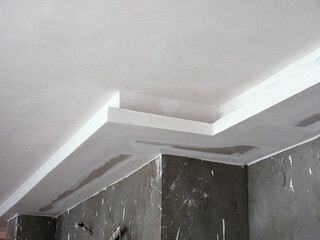 The latest in indirect lighting from a modern tray-ceiling is being installed in many rooms, fashioned from gypsum-board just as back home. The wood floors will be laid over a thick sub-floor tile system. There is a chance that we will see something close to the finished product before we leave in another six weeks. After the construction tour, we headed for lunch. Linda and I have been hoping to find a restaurant serving a good shawerma plate such as we find back home at Gyropolis in Bloomington. 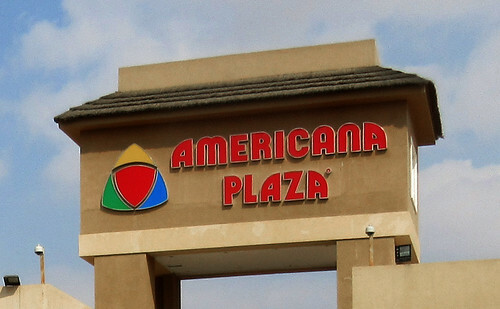 Our friend had heard good reports about one place located at a nearby mall. We arrived at the Americana Plaza to find a pleasant assortment of familiar brand names from Baskin Robbins and Dunkin' Donuts to TGIFriday's. I thought there might be a Waffle House nearby but I was just noticing the aroma drifting by from a small waffle stand. 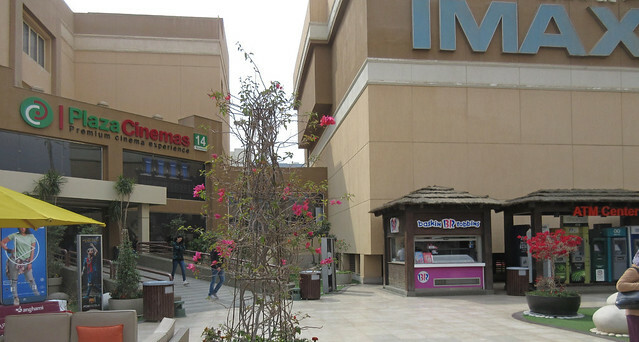 There is both an IMAX theater and a 14-screen cineplex in the plaza, so we walked over to see what films were playing. You would probably recognize most of the half that had English titles. 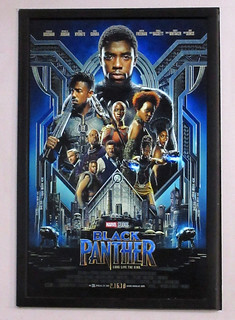 It appears that many were eagerly awaiting Black Panther here, just as at home. I was surprised to see that the latest "Fifty Shades" film was also playing here. 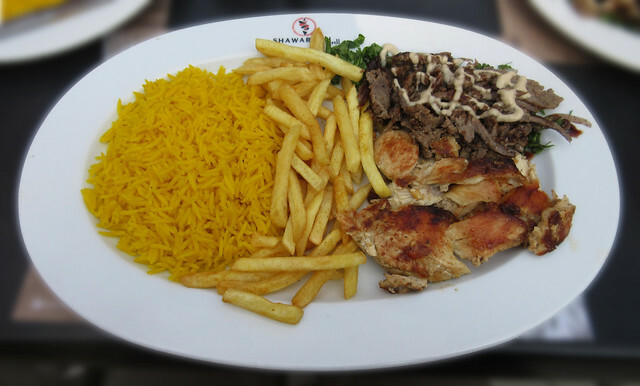 We found the Shawarmaji & Grill and had a very tasty lunch. The shawerma plates are priced at well under four dollars. We had a choice of beef, chicken or a combination. I had the combo plate. Gyropolis is still the winner in flavor, but Shawarmaji gets the nod on value. 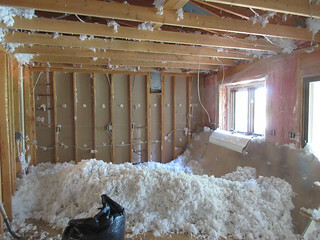 Within the first week or so of our arrival we settle up the utility bills and get connected to the Internet. He had a couple of bills from last March and April that he had obviously been carrying around for some time. Next up is the Home Owners Association fee of 150 pounds per month. This is not collected in the same way as in the U.S., where it is automatically deducted from our bank account. My neighbor across the hall, Mohammad, is the property manager here- he would gladly surrender the duty if someone else would take it. I enjoy paying this one since I will get a glass of tea or maybe even strawberry milk and get caught up on all the local news. No business can happen without the obligatory cup of tea. The $8.50 per month seems quite reasonable since it includes water, the services of our bawaab, who cleans the stairway and halls most weeks, and electricity in the common areas. The garbage man comes about three times a week and for that we pay 20 pounds a month, well over a dollar. 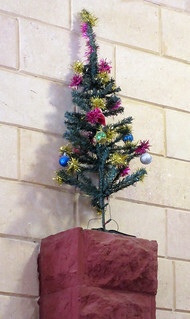 Inflation has hit hard in Egypt as this was only 10 pounds a month when we first moved in. The Internet is our biggest expense. 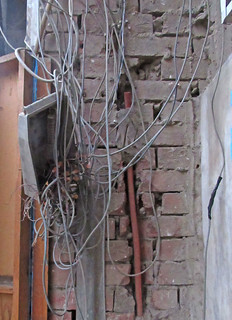 You may recall that we had gotten this under control last year with a land-line and DSL service. So far we have about $40 invested in our internet service. We have some of the best minds on the west side of the river working on this problem. Unfortunately, the area's crack telephone trouble-shooter died over the past summer. I will keep you posted. So we are back to using 3G wireless service from Vodafone where we buy data by the Gigabyte. It took an hour and a half at the Vodafone store to get ourselves set up on this service again. With that accomplished, Linda wanted to download a new book from the Minneapolis public library. This, however requires a WIFI connection and Wireless won't do. So we were off to the Cafe up the street. 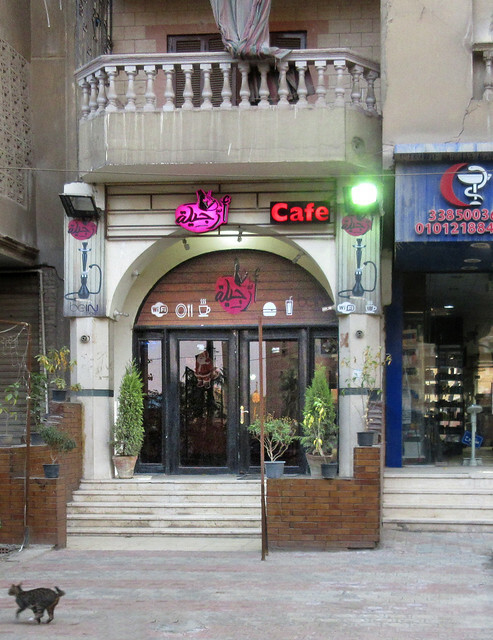 The cafe has a new name and new proprietors again this year. 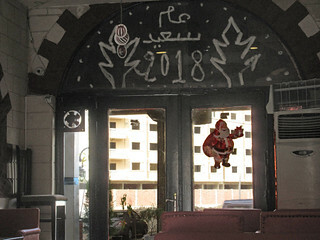 If you look closely at the picture above you will see that the place is still decorated both for Christmas and the New Year. As soon as we input their password, Linda's Kindle downloaded the library book from Amazon. 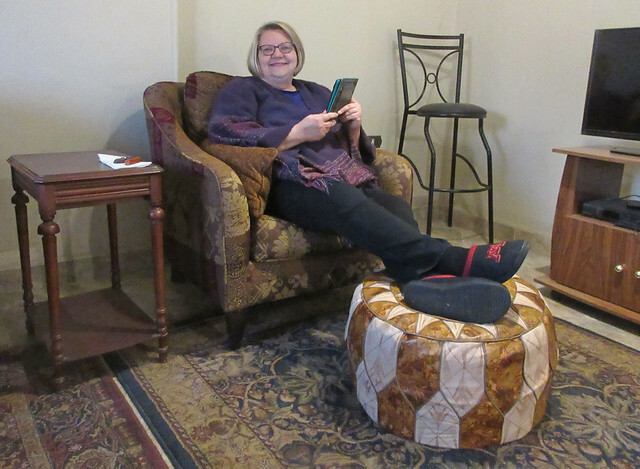 Back in the Cairo condo, she can now read at leisure. What did this WiFi connection cost us? Just two cups of tea at the cafe, about a dollar. 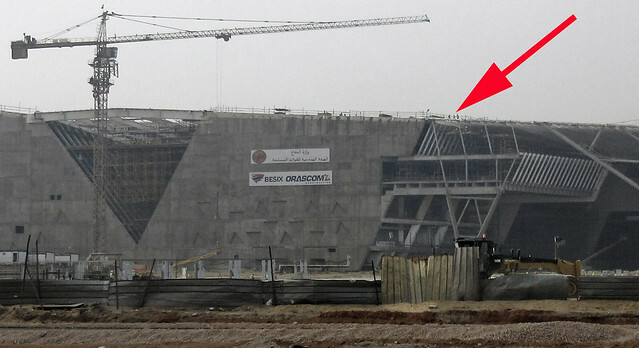 On a trip out to the northwestern suburbs we passed by the construction site of the new Grand Egyptian Museum (GEM). You may not have been following this project for as long as we have. You really can't get a grasp of the size of the building from that picture, so let's look a bit closer and see if we can spot some construction workers. 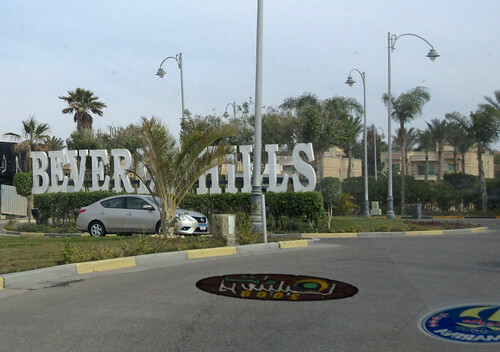 The site is not much over a mile from the pyramids and promises a much more convenient and relaxing visit to the ancient artifacts, especially if you are coming from the port of Alexandria as many cruise patrons do. 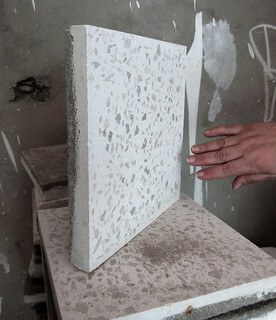 The cornerstone for the museum was laid in 2002 by Hosni Mubarak. The construction contract was signed in 2012. 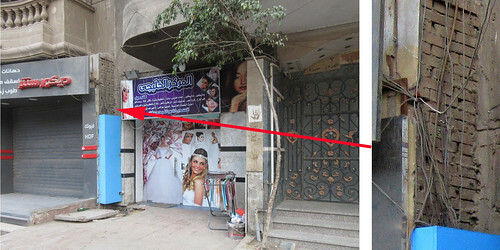 The two company names on the banners are Besix, the large Belgian contractor and Orascom, the large Egyptian contractor. Both of these outfits can get the job done given enough money and reasonable plans. Besix discusses the difficulties of "this highly complex and difficult-to-construct building" on their GEM web page which also features a nice conceptual drawing of the finished product. Current costs for the construction total about one billion dollars, financed 75% by loans from the Japanese government. Expect more change orders! I wonder what the entry fee will have to be in order to help cover the construction costs. While we had made it onto our connecting flight in Paris on Wednesday night eight days ago, our luggage had not. 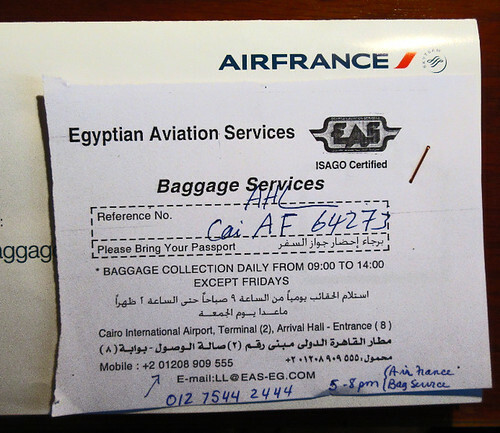 Our baggage claim details were duly recorded at Cairo International Airport and a claim number was issued to us. The recommended strategy was to call back to the airport in the early morning when the day shift could let us know how things were progressing. Note that Egyptian Aviation Service works from 9 till 2 except Fridays and Air France answers the phone between 5 and 8 pm. Welcome to Egypt! Finally got through - in excess of half an hour. Without the number she couldn't help. She tried to use your name but didn't find anything that way either. Don't suppose you were traveling incognito? I did ask if the delta.com/baggage was kept current. She said emphatically yes! She also said that Paris has 8,000 bags trying to get to destinations and some are getting moved on, but can't give specific help without number. Sunday night the Cairo airport let us know that Air France would be sending our luggage the next day. Linda was cautiously optimistic. Your baggage no.212926 is on board flight AF508 to Cairo airport. We will contact you as soon as it arrives at the airport. More updates followed from Air France and finally a call from the airport to arrange delivery. 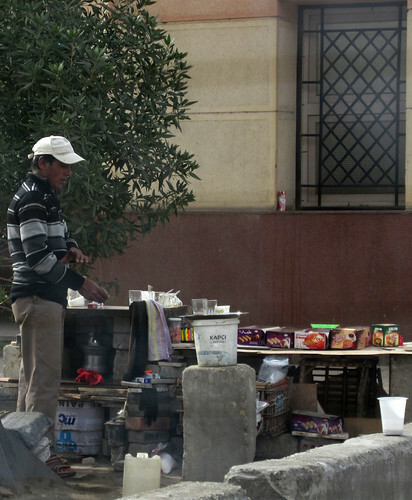 Tuesday morning, a sturdy Egyptian lady rolled by in a sedan packed with bags and presented our luggage. Delivering lost luggage, by the way, is a pretty good gig. I had a good friend in college who had the Portland late baggage delivery franchise for Northwest Airlines. People receiving their bags are happy to see them and tip generously. I did so too. 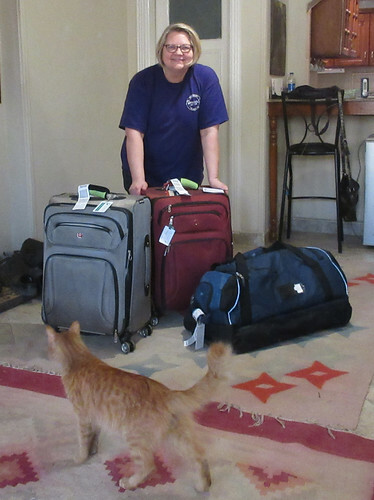 Linda was happy to see the bags after a week, and Rusty could tell there was something in there for him. 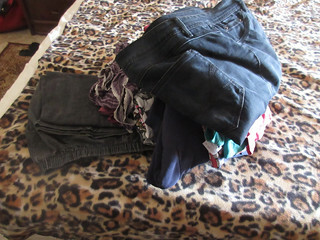 Linda's clothes take up a small space in the luggage but were much desired. 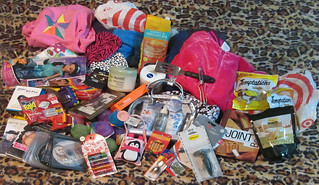 Most of what we bring amounts to about a hundred pounds of gifts for friends, especially their children. A few items are for apartment maintenance like the weatherstripping and ant traps. And we bring along a few food items like bacon and Jerky snacks that just aren't readily available here. And, of course, a few cat treats. With gifts in hand, we could begin visiting our friends. 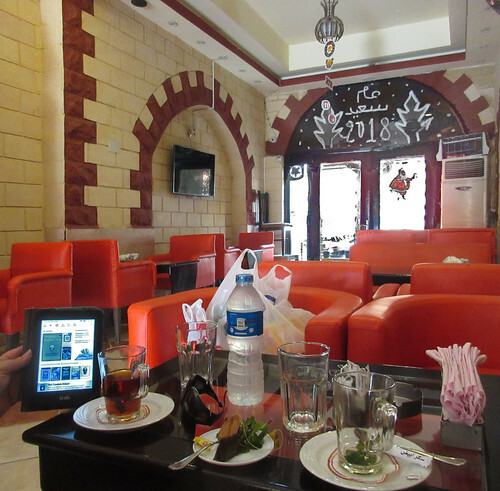 We flagged down a taxi and headed east to cross the Nile and enter Maadi, one of the "upscale" parts of town. About a half-mile short of our destination, the driver pulled off the Ring Road, slowed down and pulled to the side along the frontage road. Perhaps we were out of gas? At least the driveshaft hadn't fallen off or the hood blown free - things we have witnessed along this stretch of freeway. It turns out that the engine had just overheated. It is time for a taxi update! It seems like only yesterday, but it was actually eight years ago that Cairo began a program to modernize the taxi fleet. That means the shiny new Hyundais and Chevys are well into middle-age. We had coasted to a halt near a small mosque along the frontage road and there was an entrepreneur set up nearby selling snacks and tea. 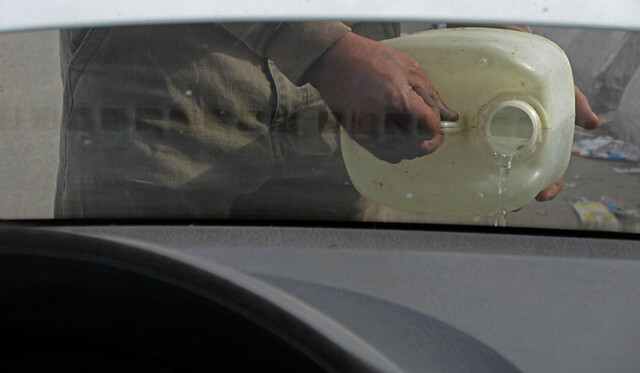 Tea, of course, requires water - we were in luck since our driver didn't have his own supply in the trunk. I would normally get out of the car to look under the hood and get pictures - but the left passenger door was broken - no window cranks either. The driver's seat had me pretty well pinned in anyway. So I took my photos through the windows. The driver flipped on the heater to help cool the engine - unleashing a small dust storm inside the car that inflicted a coughing fit upon Linda. He then relieved the pressure in the system and headed back to borrow some water. Filling the radiator gave us an operational vehicle and we moved on to our destination. 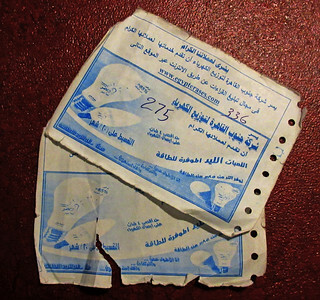 Taxi fare on the meter for the nine mile ride was 43 Egyptian Pounds - about $2.50 U.S. I tipped generously as I suspect he is going to be needing a new water pump soon. 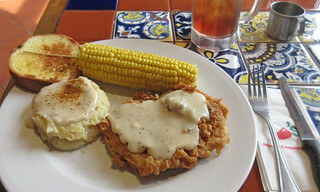 Our first stop at the shopping center was at Chili's for lunch. 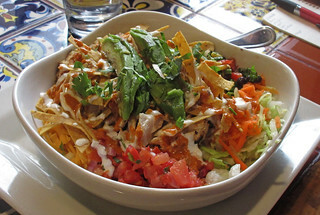 They had a couple of specials that looked good including a Chipotle Chicken Tex-Mex Salad topped with avocado. The waiter warned us that there would be no avocado, however. I ordered my usual chicken-fried chicken. It is like stepping from the third-world to the first and back to the third on these trips. Wait a minute - didn't you say there was no avocado? Yes, but our waiter spoke to the manager on Linda's behalf. Not sure what that means but as the picture shows, Linda's salad is indeed topped with a sliced avocado. This is now Sunday and there is still no baggage and no word from Air France on what happened to those hundreds of bags that didn't arrive on Wednesday night. Since we purchased our ticket from Delta, we have sent an email to them asking for help or any info they may have on the situation. We lost a month of our winter vacation in Egypt dealing with the final stages of our townhouse remodel. 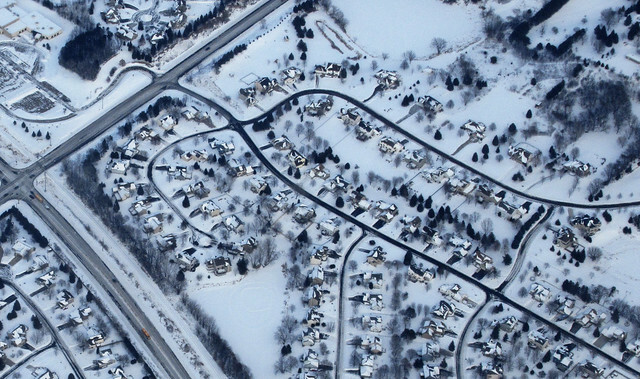 December and January were two of the coldest (but not the snowiest) winter months in recent memory in the Twin Cities. As the temperatures dropped below zero during December we even had the chance to talk about that wonderful point where Fahrenheit and Celsius scales show a common value of minus 40. Yes, it actually got that cold in the appropriately named Embarrass, Minnesota on December 27th, 2017. 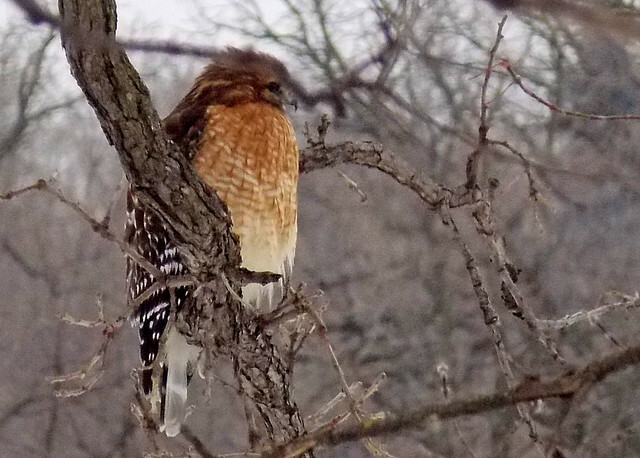 While all sensible creatures migrate South for this period of time, the red-tailed hawk that hangs around in the tree outside our back window takes it all in stride. He can't read the thermometer, after all. Since we were not leaving until after the end of January, we waited an extra week so that I could watch the Superbowl - hosted right in the heart of downtown Minneapolis - before leaving. Our departure was on Tuesday afternoon for Atlanta and most of the plane was filled with football fans returning after a pleasant stay in the area. 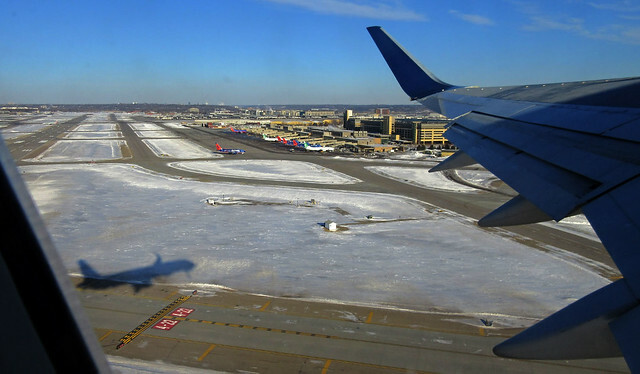 We made a rare departure to the south on runway 17 rising over the Mall of America after leaving the airport. The lighting and shadows gave a surreal appearance to the winter landscape as we climbed out over the southern suburbs. 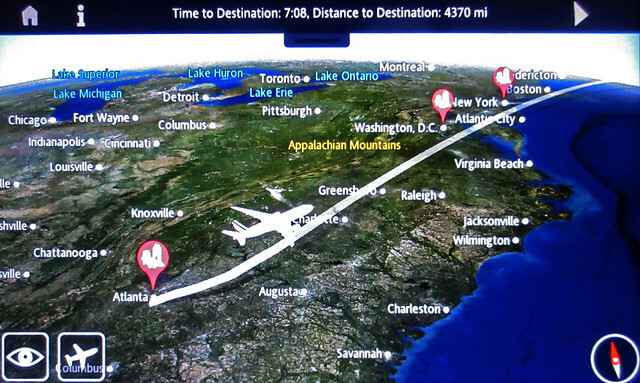 We changed planes smoothly at Atlanta's Hartsfield-Jackson airport moving onto another Delta flight, this one operated by Air France staffed by French flight attendants headed by a chief steward with a haughty French attitude. This was a 777 with very nice flight electronics displays. 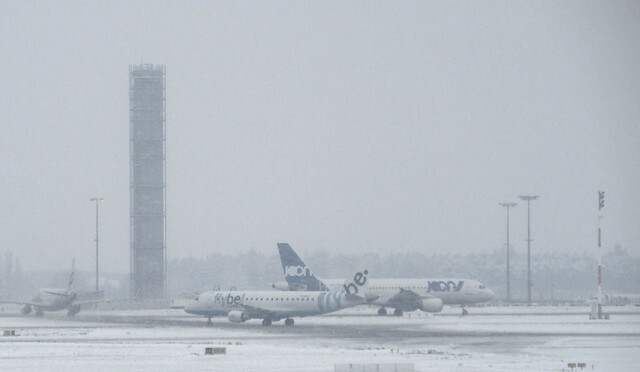 The captain's initial weather report detailed the temperature in Paris at -2C with snow falling. Oh-oh! 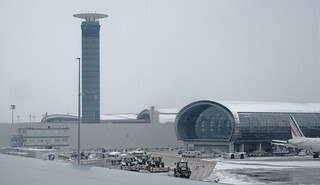 Upon arrival, some seven and a half hours later, we found Paris' Charles de Gaulle airport operating with a single runway and most connecting flights described as "cancelled or delayed." Our connecting Air France plane for the flight to Cairo was already at the gate needing only fuel, baggage and passengers. 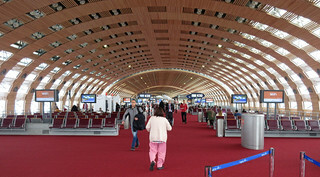 Air France international operations requires a second security screening. And why not? The signs indicate that poultry, ham and cheese are prohibited in our carry-on luggage and we had been checked for none of these in Minneapolis. On the other hand, we were not entering France - just passing through. The media described Paris as "Grinding to a Halt." In practical terms, that means that the security personnel, baggage handlers and fuel-truck drivers couldn't get to work that morning. It took a good hour and a half to make it through the security check. The reported 10-15 cm of snow would have been merely an annoyance in Minneapolis but in Paris it even shut down the Metro. But isn't that underground? Oh, those crazy French! Air France remained optimistic, announcing a one to one-and a half hour delay several times. Each time they did this, they called our telephone number in Minneapolis and announced the delay to our house-sitter in the wee-hours of the morning. The terminal is laid out with travel efficiency in mind. Seating is abundant. Rest rooms, food, drink and retail are sparse. You want a drinking fountain? No one drinks the water in Paris, my friend. How gauche! If the terminal design looks vaguely familiar, you may recall seeing pictures of the collapse of part of the structure back in 2004. We boarded the plane for Cairo about five hours late. They were still fueling the beast and the pre-flight announcements suggested not buckling our seat belts in case an emergency evacuation should be necessary. The French are nothing if not frank. 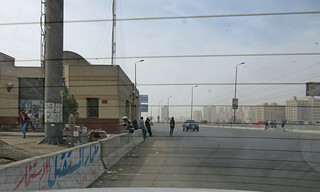 Our arrival in Cairo was at the modern Terminal Two. If you have not been to Cairo International lately, you will be pleasantly surprised at this modern first-rate airport terminal. 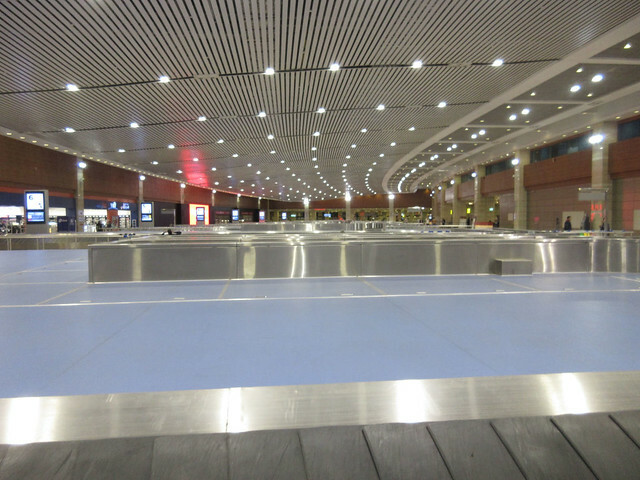 This view of the sparkling clean and hassle-free baggage claim area is quite a contrast to what you might have experienced in the past. Unfortunately, we had no bags on those shiny carousels. 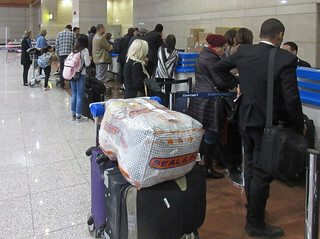 The hundred and fifty or so passengers from the Paris flight filing lost luggage claims were handled in about an hour. It was Linda's misfortune to be behind the lady filling out claims for eight bags. From that point, things went very smoothly. Our friend, Roshdy, had patiently waited a few hours for our arrival and whisked us home in his new car. Our building now has a security lock on the front door and Sayed, our bawaab, had a key waiting for us. 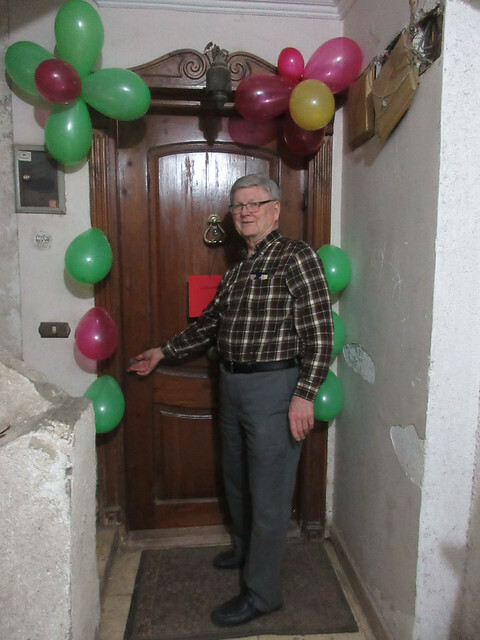 Our neighbors across the hall decorated our front door to greet us and Rusty, the building's mouse abatement cat, remembered us and greeted us enthusiastically. It is now about forty-eight hours since we arrived and our luggage is still in an undisclosed location. I suppose it is appropriate to explain the abscence of blog posts for the past several months. When I chose the title for this post, I did look up a dictionary definition of "hiatus." ... noun ... formal. a short pause in which nothing happens or is said, or a space where something is missing: The company expects to resume production of the vehicle again after a two-month hiatus. Well, that seems appropriate. While the blog was where nothing was said, the space where something was missing was at our home. We had begun a "thirteen week" remodeling project at the beginning of August just before we left for Nebraska on the solar eclipse expedition described in the next post below. 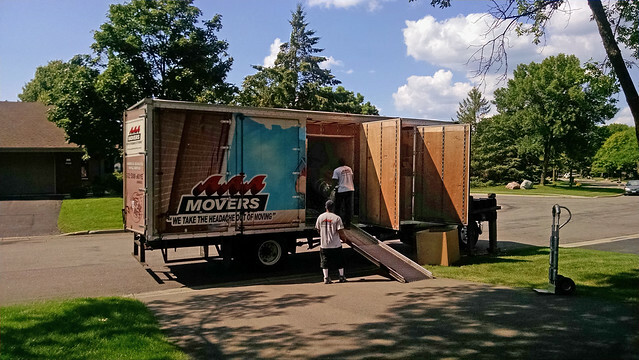 The experts at AAA Movers loaded up most of our main floor furniture and took it away to their warehouse. 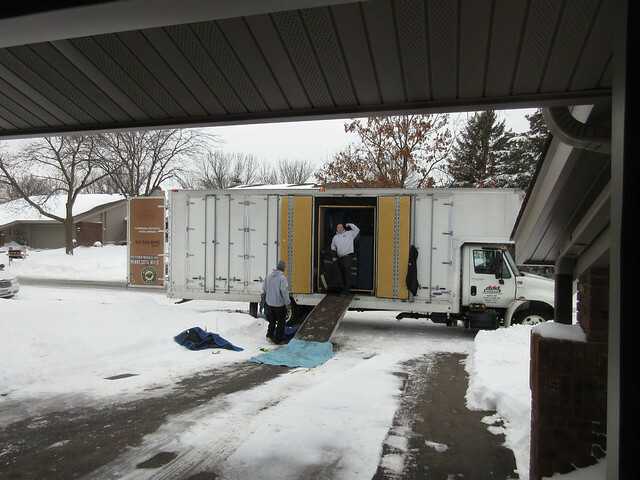 We moved mostly into the lower level, added a dumpster to the driveway, put forty boxes of small items in the garage and moved ourselves behind two zippered plastic doors for the duration as the kitchen was promptly "demo'd." 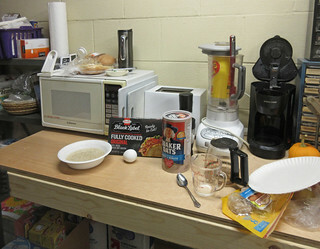 We learned to make oatmeal in a microwave oven - to even poach an egg and prepare microwave bacon and sausage too. Hamburgers on the grill were still a real treat, even as the temperatures dropped below zero. Thirteen weeks stretched into twenty six and we burned out one and a half project managers along with all of our patience. Linda has purchased and read a book on the psychological benefits of swearing. I purchased the domain name "www.fbcvictims.com" - (FBC was our contractor) and have the brightest minds in India calling me to ask about helping me build my new website. Here is the before and (almost)after view of the kitchen. There was still one drawer-front missing at this time, plus a few drawer-pulls and a list of about fifty other items. But AAA Movers returned the furniture, made no scratches, left no marks and we finally did leave for Egypt.